And let's not beat a dead horse.That race has been renamed, and it's different enough from the Melnorme that no reasonable person would consider that copyright infringement. Case closed, from my point of view at least. And by the way, thank you for renaming these races. Edit: I've requested the name to be changed from Maelnum to Maelnir despite the fact that you can't copyright a word. Whether you can copyright a word, as you know, is irrelevant. That's like saying you can't copyright a pixel. Or you can't copyright a color. If you see a single word used in two works, it's probably a coincidence. If you see a phrase appear in two different works, there almost definitely was copying. The same is true of key words. Maybe there's some "Slylandro" that's appeared in some other copyrighted work without any kind of issue. But if you see "Slylandro", "Pkunk", and "Super Melee" all appear in two different games, along with massive similarities in lore and character, would anyone believe it's just a coincidence? By that token, changing more stuff is a wise idea. And, speaking for myself as a fan, the less you take without permission, the more I appreciate Stardock trying to show some good will. That being said, from a legal standpoint, it might not be enough. Frankly, a subtractive approach to copyright defense might have already damaged you. You started with a prequel in the same multiverse (unlicensed at that). The first previews featured elements of someone else's lore, their ships, and even aliens by the same name with a subset of the same features. Subtracting and modifying the copied elements can make your game less similar. But that can't change the fact that you started with (even partial) copying. If I take someone else's character -- with their art, their personality, and backstory. Then add an eye. Then bend the shape a little. Keep the personality but change the backstory. Is it still similar? Probably. Change it from its common name to its name from deep in the lore. Still similar? Maybe. Change the second syllable in their name. Still similar? Less so. But at the first step, did I copy? Yes. The problem is that no matter how many changes you make, you can't escape the original sin: you started by copying material from someone else's copyrighted work. Modifying pieces of it doesn't change the fact that it was a copy, any more than dozens of surgeries could make me into a legally different person. What you're left with is still evidence of copying, which is a key element of the test for Copyright infringement. In some cases, the lack of similarity is a mitigating circumstance, and it has for sure resulted in many a successful defense. That being said, there are harsh cases where judges have ruled that evidence of copying without permission is itself sufficient evidence of Copyright infringement. The reason for that is to avoid ambiguous cases where people need to spend hundreds of thousands of dollars to roll the dice. A lot of judges would rather make it clear: if you copy without permission, you're done. It's your legal right to take that risk. But the only safe course would be to create a new alien from scratch, instead of tweaking a potentially infringing alien one piece at a time. Right. So from your point of view the only action Stardock could take that wouldn't infringe on F&P's copyright would be to cancel SCO? Because, you know, since F&P argue that SCO started with infringing material present in it (which is still up to the courts to decide), it will be forever cursed with the "original sin"? I'm also against having "Arilou" and "Chenjesu" and whatever else from SC2 in SCO without F&P's permission. However, what you are saying would mean that drawing any kind of inspiration from other works of fiction constitutes copyright infringement (since it could be argued that it all began with "copying" an element from another copyrighted work). However, nearly all of fiction shows us that this isn't the case. Suffice to say, our position with regards to names will be reciprocal. Edit: Rose, your legal beliefs are just nuts. There's just no other way to describe it. They have no basis in law or fact. It doesn't help that you obviously have no familiarity with Star Control: Origins or even what copyright is. Well, I seriously doubt that F&P would ever want to put "Tywom", "Scryve" or "Mu'Kay" into GotP. And if they did, you would have every right to sue them for that. No, I but I suspect they want to use names that are connected to Star Control that might cause consumers to believe their new game is connected or associated with Star Control. If a game came out that had the Spathi and Ur-Quan and Orz, I think it's safe to say that many people would believe it is connected and/or associated with Star Control. Therefore if they want to make a game that utilizes elements connected to or associated with Star Control II they will need our permission. Imagine Star Control 2 was actually a text adventure. And that Star Control Origins was also a text adventure. Is it possible to create a Star Control Origins text adventure that doesn't constitute infringement of a Star Control 2 text adventure? Of course. But, that does not mean it is *impossible* for a Star Control Origins text adventure to commit copyright infringement against a Star Control 2 text adventure. From another angle: Infocom once upon a time made a game based on The Hitchhiker's Guide to the Galaxy. What if, right before release, they had a falling out with Douglas Adams and the deal was canceled? Would all Infocom need to do would be to change the name of the game and release it? Or would they have to make changes to the content of the game? What sort of changes might they have to make? Yet another take: imagine if Infocom managed to acquire the rights to a trademark "The Hitchhiker's Guide To the Galaxy", and a copyright to the dolphins story from So Long and Thanks For All The Fish. However, the rest of the book copyrights remained in the hands of the Douglas Adams estate, who didn't want to license them. What might be danger zones for Infocom in creating a Hitchhiker's Guide to the Galaxy game that would risk being sued for infringing on the book's copyright? How do you square the idea that they need your "permission" to "utilize elements connected to Star Control II" with your repeated assertions that "no one is stopping them from making Ghosts of the Precursors"? You know what's nuts? That. I wasn't trying to describe my point of view, but the case law as it exists now. Some judges are harsh, but they're not THAT harsh. Stardock wanted to market their game as a whole new product in the spirit of Star Control II, but an otherwise stand-alone game. That's the standard they'd need to reach to be completely safe from liability for Copyright infringement. And outside of those characters, they more or less have it. I am speaking hypothetically, because for all I know, Stardock has already removed those characters. The changes keep happening even within the span of days. This is one of the most cutting-edge areas of Copyright law in the past decade or two. The majority of judges say "even where copying is conceded, it is not always Copyright infringement," where a small number of harsh precedents basically say "if you want to copy, get a license, full stop." The latter approach might sound nuts, but that's the 6th circuit trying to design a bright-line rule in an area of massive technological change. We have said we are not trying to stop them from making a game. We will not consent to a game called Ghosts of the Precursors because it has already been connected to Star Control. How much their game is able to be connected to Star Control is going to either be determined by the courts or a settlement. Meddling with our release is not going to make us more inclined to let them connect their game to Star Control II. I mean, you should update your Q&A, because "Is Stardock trying to prevent Paul and Fred from making new games in their universe?" is almost definitely not the question that anyone is asking. The question is, assuming Stardock succeeds in their lawsuit, will Paul and Fred still be able to to develop Ghosts of the Precursors unobstructed? The answer is obviously no. Stardock, if they succeed, will have a veto over Ghosts of the Precursors, let alone anything that so much as mentions anything from Star Control 2. In your own words, what might a game from Paul and Fred look like if they used just the Star Control 2 Copyright, without any Trademark license from Stardock? All of that was written before they started to meddle with our launch. Launch is less than 2 weeks from now. We shall see what Paul and Fred choose to do between now and then. I mean, to be fair, telling your developers to add potentially copyright infringing material to the game is messing with your own launch. Maybe Paul and Fred will pursue their full legal rights. Maybe they won't. Either way, the last minute removals and changes are wise. And even just from a PR standpoint, I know there's at least a few fans who appreciate it (including me). That being said, nothing in the lawsuit has changed. You have said, for months, that your Trademarks are valid. The only thing that has changed isn't the lawsuit, but your spin of it, and conceding what most of us have been able to read plainly all along. That Stardock's Trademarks would completely obstruct any spiritual successor that Paul and Fred would want to create, even if they chose a different product name. Which section do you suggest that would violate? "(a) (1) Any person who, ..."
"...on or in connection with any goods or services, or any container for goods, uses in commerce any word, term, name, symbol, or device, or any combination thereof..."
Not this section, in game use is not use in commerce. "...or any false designation of origin..."
Nor this section. Use in game is not designation of origin. "...false or misleading description of fact, or false or misleading representation of fact..."
Nor this section. Use in game is not a description or representation of fact. So section (a) is out. (b) is irrelevant, being about importing. "(c) ... Subject to the principles of equity, the owner of a famous mark that is distinctive, inherently or through acquired distinctiveness, shall be entitled to an injunction against another person who, at any time after the owner's mark has become famous, commences use of a mark or trade name in commerce..."
Again, use in game is not use in commerce, so (c) is out as well, even assuming Star Control is a 'famous' mark. (d) is about domain names so also irrelevant. On another note, it occurs to me that the Chenjesu and Arilou DLC, containing only art and music, could be considered 'Single creative works' and therefore their titles may not be eligible for trademark protection. 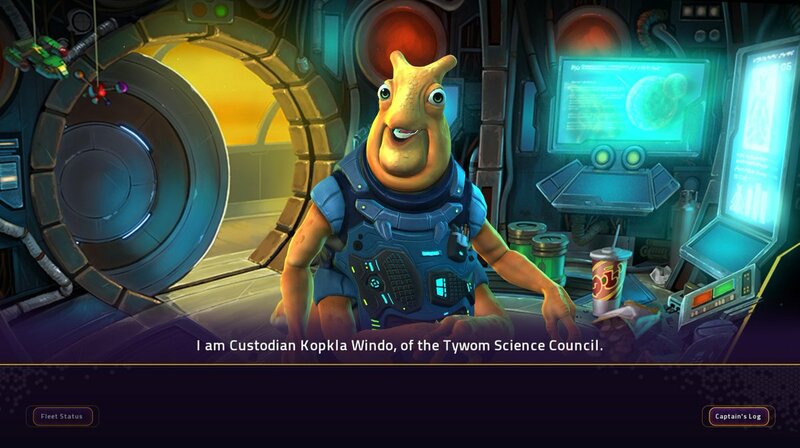 Stardock's Trademark applications for the SC2 alien names are unprecedented. The bright-line rule for Copyright infringement is admittedly a minority of case law. But Stardock's aggressive interpretation of Trademark is so fringe that I've never seen it. Even when I look for it, I see more and more judges confine Trademark to its common sense role: as an exclusive designation of origin, and not a weapon against anyone who uses a word. Even when you acquire a Trademark in something, it doesn't allow you to exclude people from using those words in their original sense. If I somehow were able to Trademark "Frogboy", it might give me the power to start selling products under that Trademark, but it doesn't let me exclude someone who can prove they've been using it long before I came along. And that's assuming I can even acquire the Trademark in "Frogboy" in the first place. You can only acquire a Trademark if it's a distinctive designation of origin. Under Stardock's fringe theory, I would try to say "stop calling yourself Frogboy, because I own that Trademark now, and you're confusing people about who the real Frogboy is." But there's no way a court would let me sue someone for "confusing" people about the real Frogboy, when my Trademark in Frogboy was never distinctive in the first place. Namely, there already is a Frogboy, and he's been that for decades, independent of any Trademark claim I could try to make. This is exactly the thing that Trademark law is supposed to avoid. Imagine if you could Trademark anything that people are already using, and then sue them. It would be legal anarchy. This is why Trademark is based on use. If someone is already using it -- for example in their Copyrighted material in an open source project -- you don't get to come along nearly 20 years later and extinguish their rights.